In business, your brand promise is everything. It tells your customer exactly what he should expect from your brand. It is your form of goodwill which you must uphold at all costs. Regarding my online eBay store, I ship only domestic and global USPS priority mail. I also offer reasonable prices on tall women’s affordable luxury fashion. The customer knows this every time she enters my store. 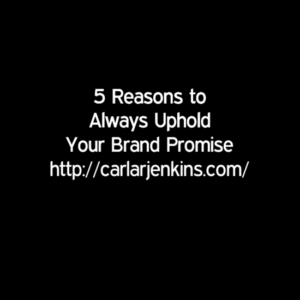 View your brand promise as your competitive advantage. Your competitive advantage is something that you do better than everyone. What does your brand stand for? Regardless of business cycle, maintaining your brand promise is a non-negotiable in business. Brands that don’t uphold it go out of business soon. Your brand promise enhances and enriches your customer’s experience. Your brand promise creates a tangibility to customer. Since most business is conducted online, tangibility is a great service marker. Upholding your brand promise also means repeat customers and great word of mouth to potential customers. My eBay store motto is ‘giving you Neiman Marcus merchandise at near rock bottom prices’. Combining my motto with my brand promise, strengthens my brand strategy. My brand strategy is to serve tall women (and the men who love them) affordable luxury fashions. Knowing that she’ll get all of these benefits from my store enticing her to buy. This branding strategy also results in a 100% positive feedback rating. I focus on tall women’s luxury fashion. That’s it. Upholding my brand promise clearly communicates this message to the marketplace. Business cycles fluctuate. Your brand promise shouldn’t. These 5 tips will help you avoid any lapses. Subscribe to the Carla R Jenkins email list today! 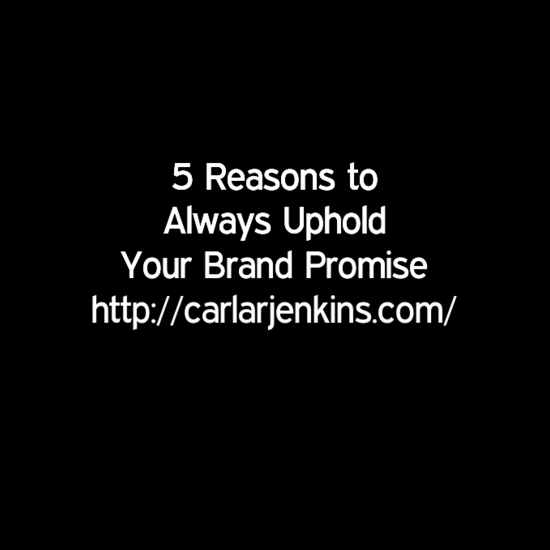 Watch my 5 Reasons to Always Uphold Your Brand Promise Video below!